By now, fall is definitely in the air and football games are in full swing. Also, pumpkin-flavored everything is in vogue, from cereal to coffee. Fall colors are usually showing up by now in most parts of the country and many people are enjoying the last vestiges of agreeable weather before dragging out the snow boots and winter coats. Let’s begin this month’s content suggestions on a more serious note and get to the Halloween candy later. October plays host to a few important emphases that are well worth noting and promoting in your small business. According to the American Cancer Society, breast cancer is one of the most common forms of cancer among women, only skin cancer is more common. Most of your readers will have been touched by this awful disease in some way. In October, consider publishing content that reminds women of the dangers of breast cancer and encourages them to learn more about it and schedule a screening. Over 1 out of 5 students report being bullied regularly in school. Bullying is wrong and harmful and can take many forms. National Bullying Prevention Month is a nationwide campaign founded in 2006 by PACER’s National Bullying Prevention Center. This is a great month to publish content about the harmful effects of bullying and show that you care about kids being safe at school, while online, and in your community. Today, the internet touches all aspects of our lives, and online scamming and identity theft is a worldwide epidemic. Take this opportunity to educate your readers about the importance of protecting themselves and their important information while online. For more information visit the United States Homeland Security website for Cyber Security Month. Host an online photo conteston your favorite social media platforms and award free products or services to the winning image. Consider featuring costumes, home decor, or delicious Halloween treats. Host a contest for the scariest ghost stories, and post the finalists on your blog. Start early promoting this and post the winners a week before Halloween. Award the winners with coupons for great Halloween stuff or your own products or services. 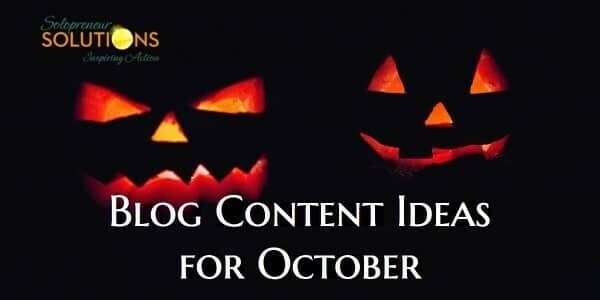 Collect and post the best DIY costume and/or home decorating ideason your blog. Start a social media commenting stream by asking users to post a pic in the comments of their favorite Halloween treatto give out, or the best ones received while Trick-or-Treating. Post an article providing important safety tips for Trick-or-Treating, including what types of treats to avoid and tips for being visible in the dark. Go on Facebook LIVEas you share treats with Halloween visitors and show off the various costumes you see. Dress up yourself and provide some type of spooky, yet entertaining, decor to attract visitors. Now here is a day that gives you a chance to both tell and show the boss what you really think of him or her. And, it is an opportunity to give your boss the appreciation that he or she truly deserves. Or, for the solopreneurs and business owners among us, go ahead and celebrate not having a boss or being the boss and treat yourself! In the United States, Navy Day is commonly celebrated on October 27th. This date was selected by President Theodore Roosevelt, an avid supporter of the U.S. Navy. In the 1970’s, research determined that the birthday of the U.S. Continental Navy was October 13, 17; however, Navy Day in the United States is still largely recognized as October 27th. What holidays grab your interest? Are there current events or holiday happenings that will attract customers or impact your business? Share them with me in the comments and of course, share them with your readers! Until next month, dress in your favorite costume, enjoy some great candy or a pumpkin-flavored treat, and as always, keep writing! Always fun ideas with Halloween around Donna. I am pondering a few right now. We get colorful and playful like kids around that time of year. At least I hope all adults get that way. Inject this playful energy into your blog.